The pilot can control the lift. Any time the control yoke or stick is moved fore or aft, the AOA is changed. As the AOA increases, lift increases (all other factors being equal). When the aircraft reaches the maximum AOA, lift begins to diminish rapidly. This is the stalling AOA, known as CL‑MAX critical AOA. Examine Figure 5-5, noting how the CL increases until the critical AOA is reached, then decreases rapidly with any further increase in the AOA. Figure 5-5. 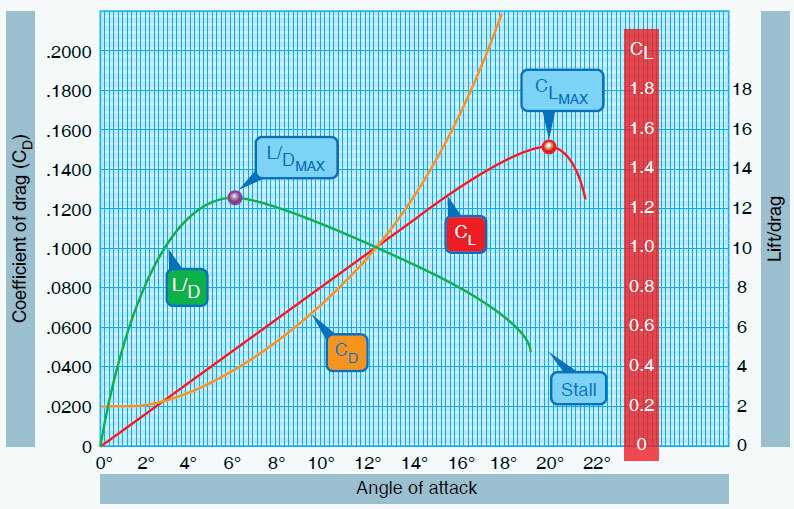 Coefficients of lift and drag at various angles of attack. Before proceeding further with the topic of lift and how it can be controlled, velocity must be discussed. The shape of the wing or rotor cannot be effective unless it continually keeps “attacking” new air. If an aircraft is to keep flying, the lift-producing airfoil must keep moving. In a helicopter or gyroplane, this is accomplished by the rotation of the rotor blades. For other types of aircraft, such as airplanes, weight shift control, or gliders, air must be moving across the lifting surface. This is accomplished by the forward speed of the aircraft. Lift is proportional to the square of the aircraft’s velocity. For example, an airplane traveling at 200 knots has four times the lift as the same airplane traveling at 100 knots, if the AOA and other factors remain constant. The above lift equation exemplifies this mathematically and supports that doubling of the airspeed will result in four times the lift. As a result, one can see that velocity is an important component to the production of lift, which itself can be affected through varying AOA. When examining the equation, lift (L) is determined through the relationship of the air density (ρ), the airfoil velocity (V), the surface area of the wing (S) and the coefficient of lift (CL) for a given airfoil. Taking the equation further, one can see an aircraft could not continue to travel in level flight at a constant altitude and maintain the same AOA if the velocity is increased. The lift would increase and the aircraft would climb as a result of the increased lift force or speed up. Therefore, to keep the aircraft straight and level (not accelerating upward) and in a state of equilibrium, as velocity is increased, lift must be kept constant. This is normally accomplished by reducing the AOA by lowering the nose. Conversely, as the aircraft is slowed, the decreasing velocity requires increasing the AOA to maintain lift sufficient to maintain flight. There is, of course, a limit to how far the AOA can be increased, if a stall is to be avoided. All other factors being constant, for every AOA there is a corresponding airspeed required to maintain altitude in steady, unaccelerated flight (true only if maintaining level flight). Since an airfoil always stalls at the same AOA, if increasing weight, lift must also be increased. The only method of increasing lift is by increasing velocity if the AOA is held constant just short of the “critical,” or stalling, AOA (assuming no flaps or other high lift devices). Lift and drag also vary directly with the density of the air. Density is affected by several factors: pressure, temperature, and humidity. At an altitude of 18,000 feet, the density of the air has one-half the density of air at sea level. In order to maintain its lift at a higher altitude, an aircraft must fly at a greater true airspeed for any given AOA. Warm air is less dense than cool air, and moist air is less dense than dry air. Thus, on a hot humid day, an aircraft must be flown at a greater true airspeed for any given AOA than on a cool, dry day. If the density factor is decreased and the total lift must equal the total weight to remain in flight, it follows that one of the other factors must be increased. The factor usually increased is the airspeed or the AOA because these are controlled directly by the pilot. Lift varies directly with the wing area, provided there is no change in the wing’s planform. If the wings have the same proportion and airfoil sections, a wing with a planform area of 200 square feet lifts twice as much at the same AOA as a wing with an area of 100 square feet. Two major aerodynamic factors from the pilot’s viewpoint are lift and airspeed because they can be controlled readily and accurately. Of course, the pilot can also control density by adjusting the altitude and can control wing area if the aircraft happens to have flaps of the type that enlarge wing area. However, for most situations, the pilot controls lift and airspeed to maneuver an aircraft. For instance, in straight-and-level flight, cruising along at a constant altitude, altitude is maintained by adjusting lift to match the aircraft’s velocity or cruise airspeed, while maintaining a state of equilibrium in which lift equals weight. In an approach to landing, when the pilot wishes to land as slowly as practical, it is necessary to increase AOA near maximum to maintain lift equal to the weight of the aircraft. The coefficient of lift is dimensionless and relates the lift generated by a lifting body, the dynamic pressure of the fluid flow around the body, and a reference area associated with the body. The coefficient of drag is also dimensionless and is used to quantify the drag of an object in a fluid environment, such as air, and is always associated with a particular surface area. Typically at low AOA, the coefficient of drag is low and small changes in AOA create only slight changes in the coefficient of drag. At high AOA, small changes in the AOA cause significant changes in drag. The shape of an airfoil, as well as changes in the AOA, affects the production of lift. Notice in Figure 5-5 that the coefficient of lift curve (red) reaches its maximum for this particular wing section at 20° AOA and then rapidly decreases. 20° AOA is therefore the critical angle of attack. The coefficient of drag curve (orange) increases very rapidly from 14° AOA and completely overcomes the lift curve at 21° AOA. The lift/drag ratio (green) reaches its maximum at 6° AOA, meaning that at this angle, the most lift is obtained for the least amount of drag. Figure 5-6. Drag versus speed. Note that the maximum lift/drag ratio (L/DMAX) occurs at one specific CL and AOA. If the aircraft is operated in steady flight at L/DMAX, the total drag is at a minimum. Any AOA lower or higher than that for L/DMAX reduces the L/D and consequently increases the total drag for a given aircraft’s lift. 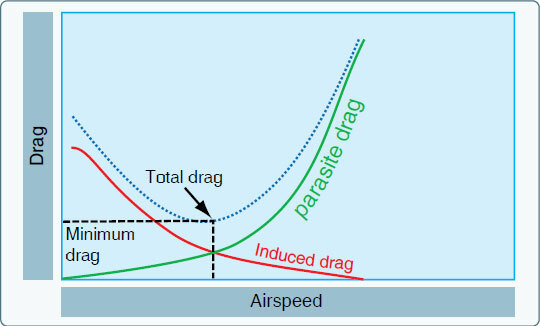 Figure 5-6 depicts the L/DMAX by the lowest portion of the blue line labeled “total drag.” The configuration of an aircraft has a great effect on the L/D.